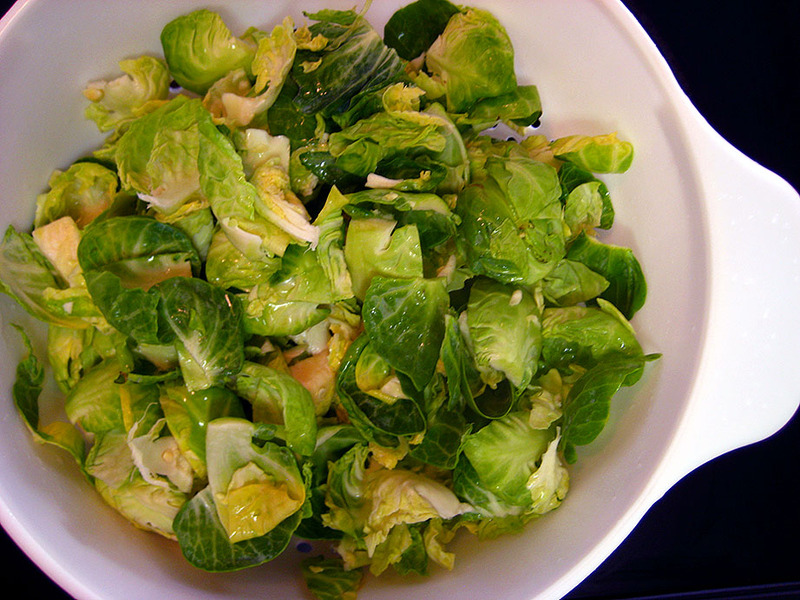 Up to this point, I’d never had brussels sprouts any other way but cooked. I’ve always been intrigued by using them raw, and thought that incorporating them into a springtime-y salad would be just the ticket. 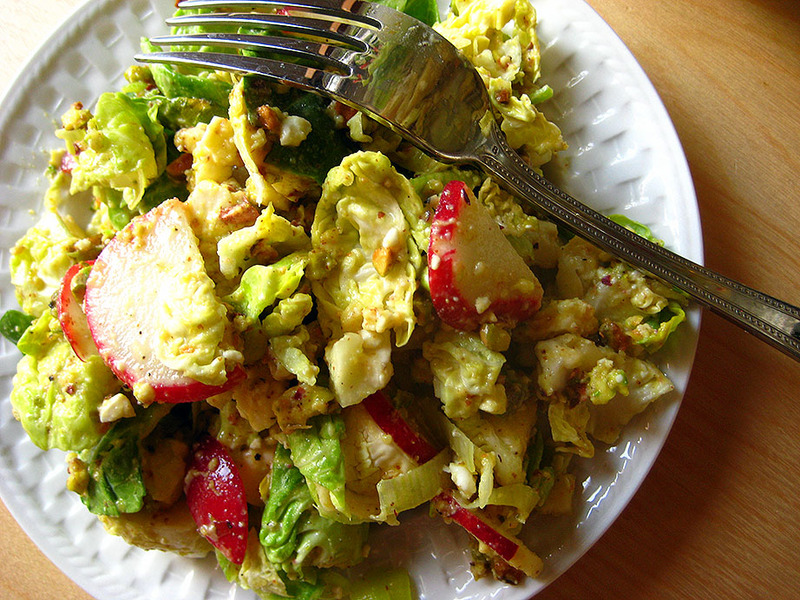 A pile of crunchy, fresh brussels sprouts with peppery radish slices, buttery pistachios, savory leeks, and salty feta, all bound together by the easiest honey mustard dressing in the world? I’ll be first in line, with my fork in hand! 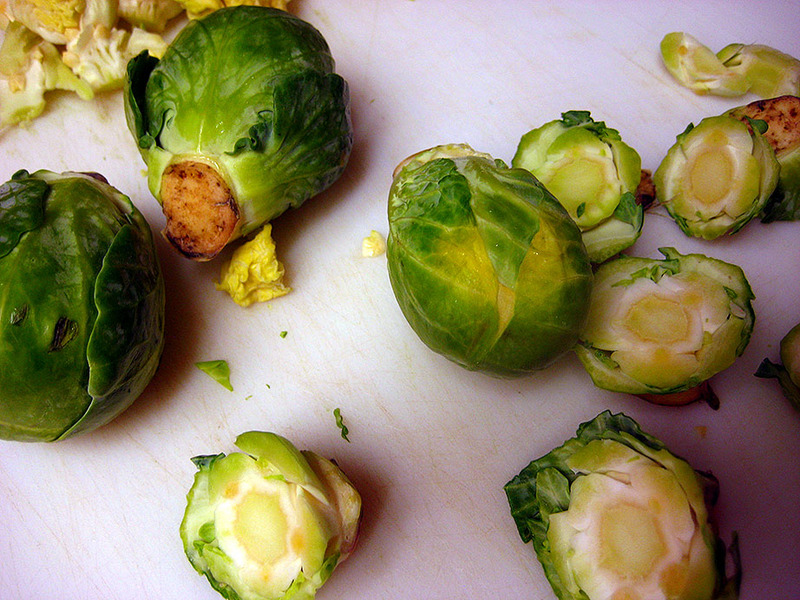 Let’s start by preparing the brussels sprouts! Cut off the stem end, and halve them lengthwise. Separate all the leaves from one another, and toss into a colander. Rinse the leaves well and dry with paper towels, or throw into a salad spinner. 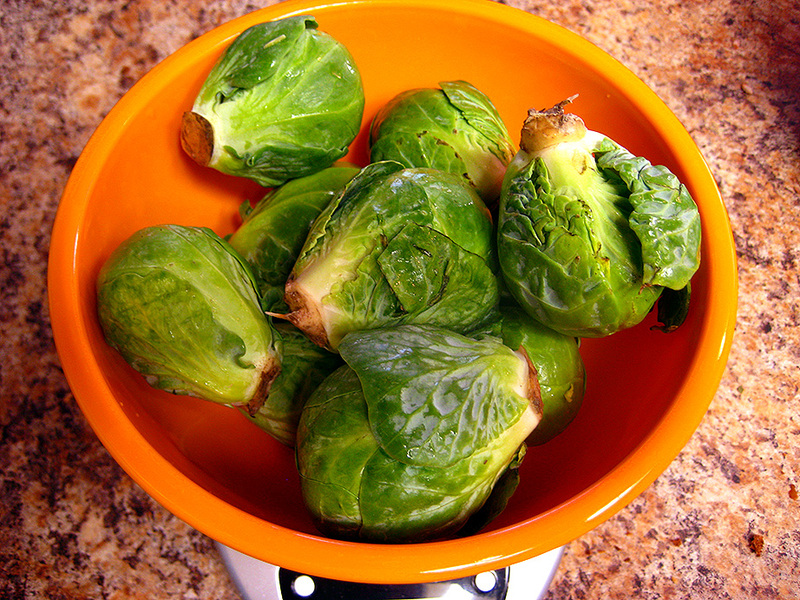 Once dry, dump the brussels sprouts into a large bowl and set aside. 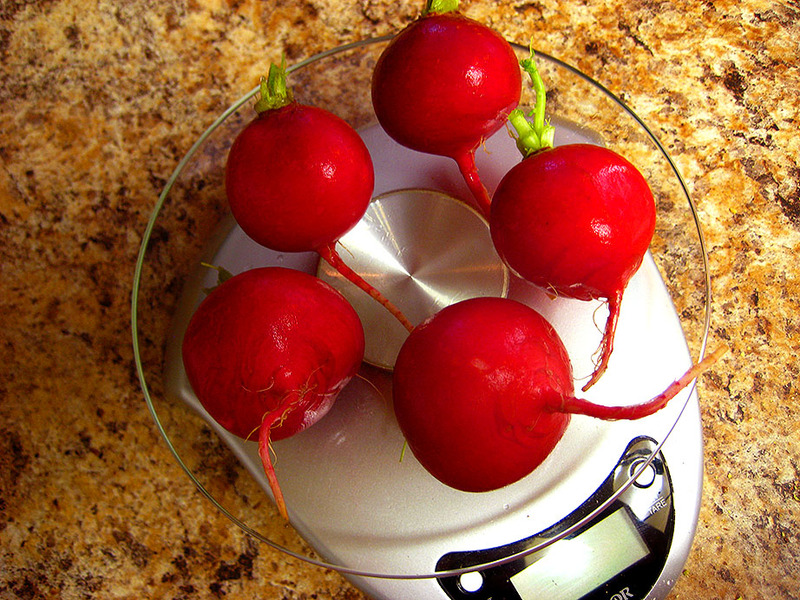 Wash the radishes and cut off the root and stem ends. Cut them in half, and cut each half into thin slices. 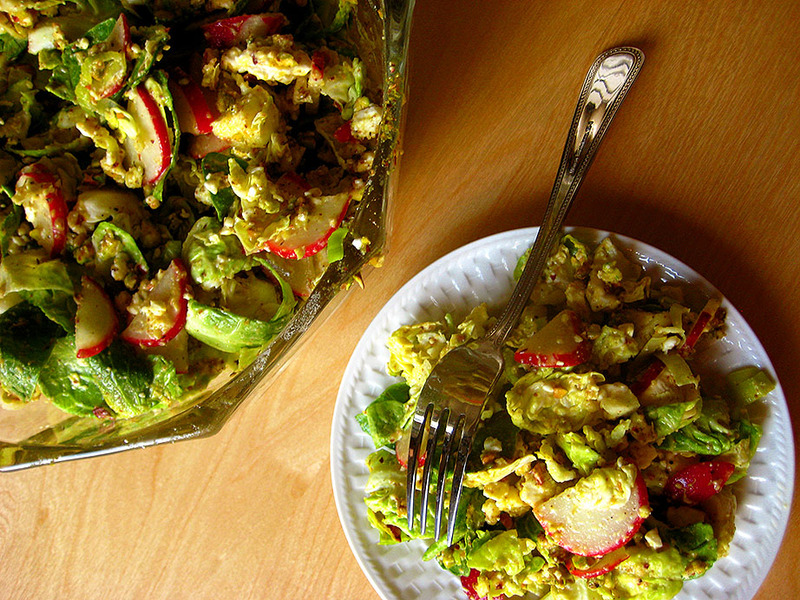 Throw on top of the brussels sprouts. 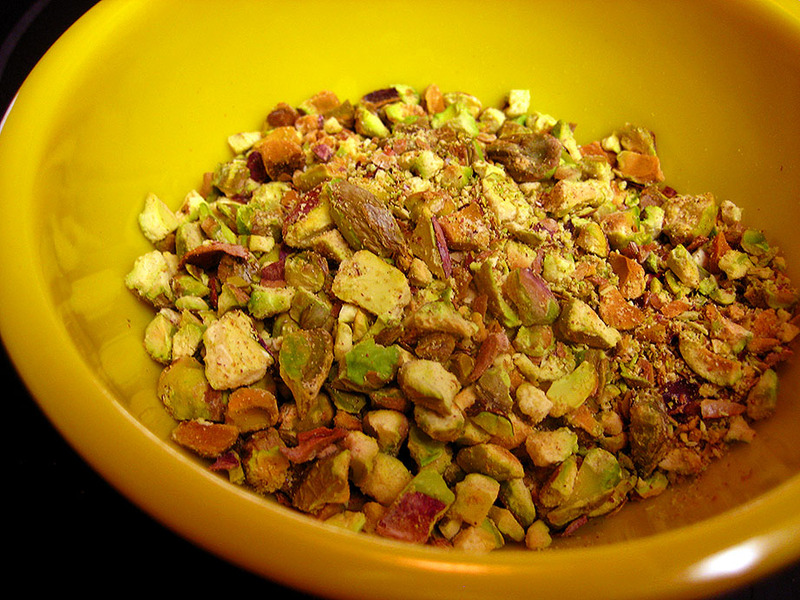 Coarsely chop the pistachios, either with a knife or a food processor. Honestly, my preferred method is to just throw them into a Ziploc bag and mash them with the bottom of a can of beans, but I’m just ghetto like that. 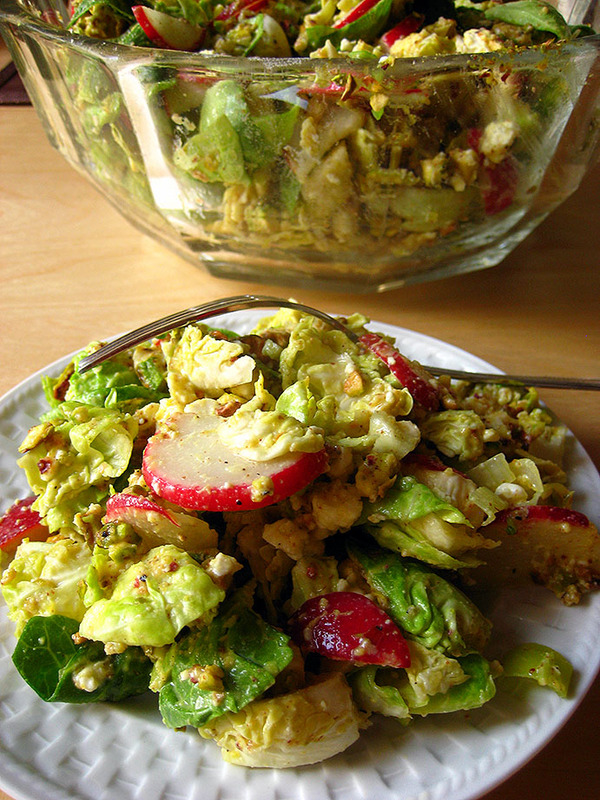 When the pistachios are as chopped as you’d like them, they’ll go into the bowl with the veggies, as well. 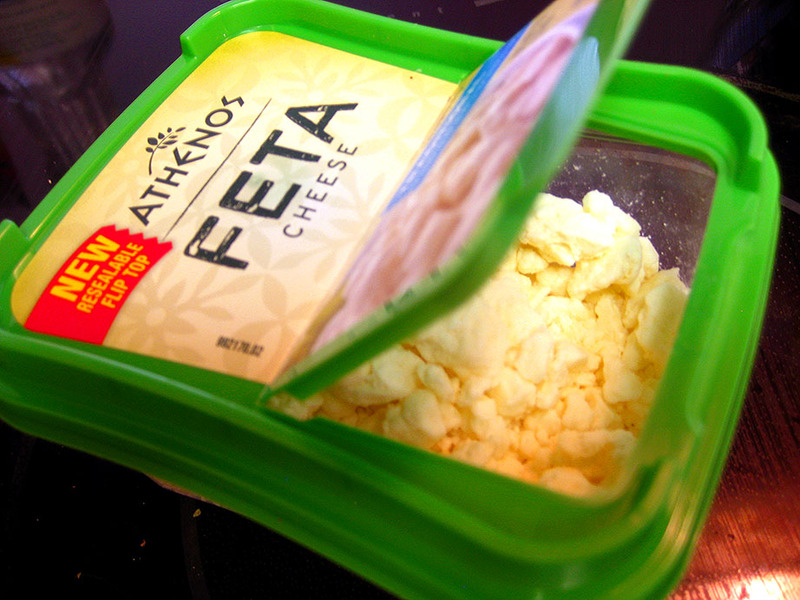 Throw in the feta while you’re at it. Next, wash the leeks well and chop them finely. Guess what? These go into the bowl ‘o veg, too. 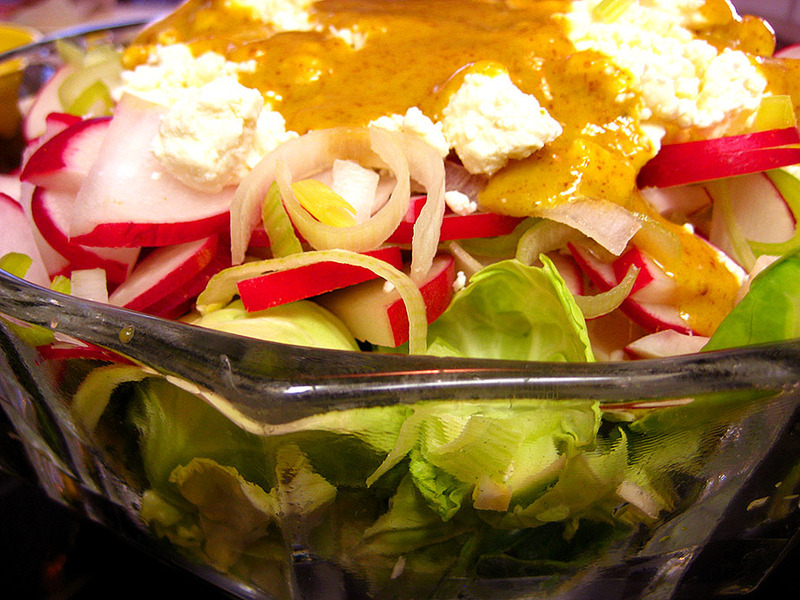 In a small bowl, mix up the honey and the mustard. Pour over the bowl of veggie goodness, and toss to combine. Add a little fresh cracked pepper and kosher salt, and toss around again. 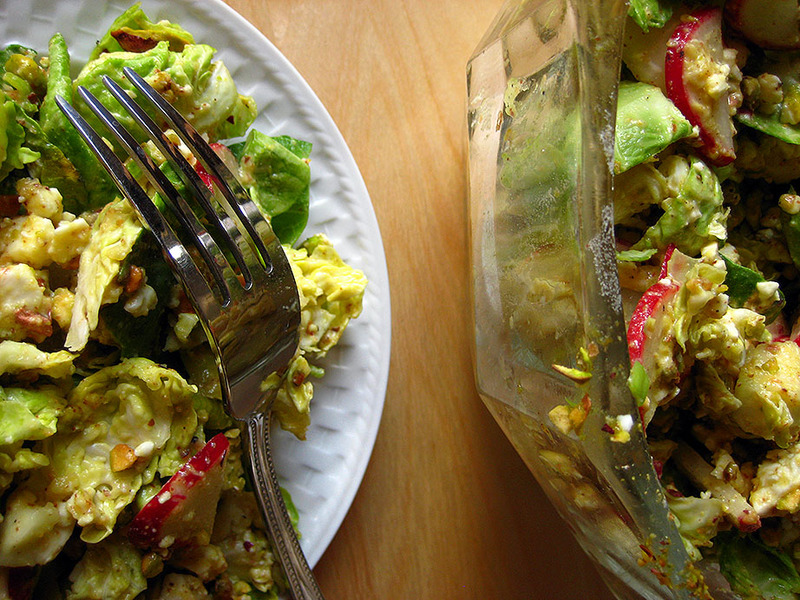 Was that not the easiest salad you’ve ever made, short of dumping a pre-washed bag of spring mix into a bowl? 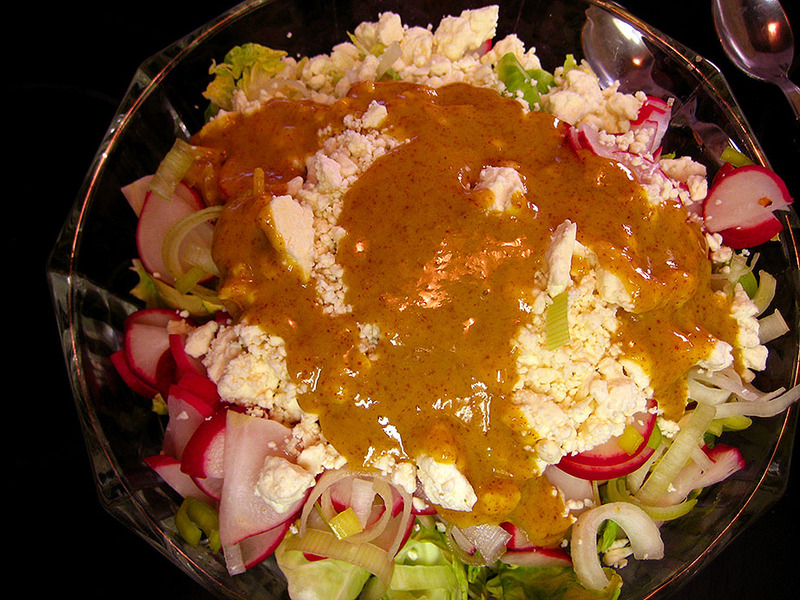 This salad is super tasty and has crunchy, creamy, salty, bitter and sweet elements all rolled into one. It’ll go great with roast chicken and scalloped potatoes (how I served it), or simply on it’s own with a big glass of iced tea and some warm buttered french bread. 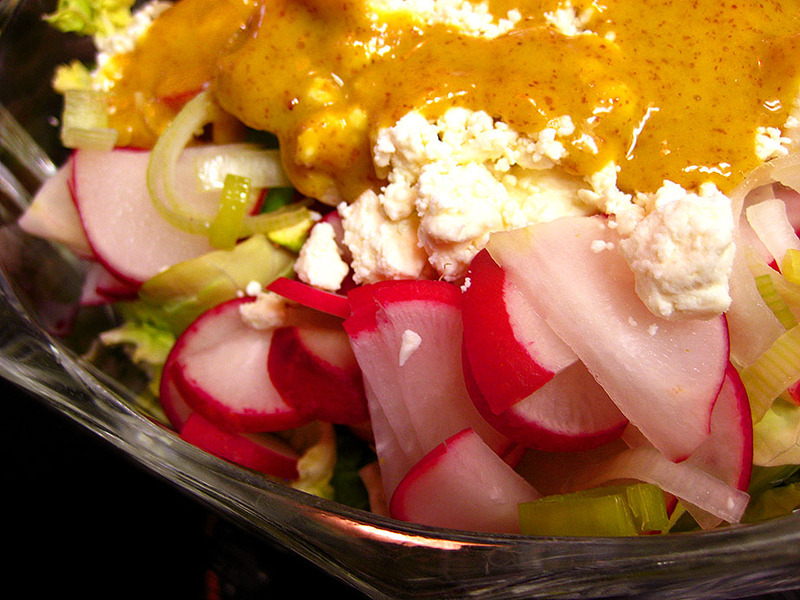 Eat it outside this spring, and wave goodbye to the chill of winter! Next Next post: diy sno-balls!